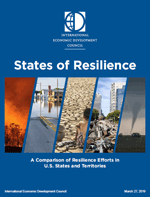 This new IEDC report looks at how U.S. States and two dependent territories (Puerto Rico and the U.S. Virgin Islands) are preparing for and dealing with the economic impacts of disaster events. The report begins with an attempt to define resilience. The interviews found most organizations focus on the impacts of extreme weather, although many also acknowledged the need to look at a broader range of threats. The responses of States, including some nonprofits within them, are broken down into four categories. 1. Preparedness – things that business can plan for before an event occurs. 2. Response – things that need to take place immediately after an event occurs. 3. Rebuilding – things that need to take place in the medium- and long-term to recover after an event. The report also details how States organize their resilience work in different ways – in terms of which departments and organizations undertake the work, how many staff they have and the backgrounds of such staff.